More cities/buildings will be found underwater - how old are we? What does the fact that more buildings, temples and cities are being found on the sea floor, submerged either shallow or deep underwater mean not just for humans but for our history? Does it show that humans are an ancient race, that the sea levels have risen and fallen dramatically (man made global warming? ), that our history has either been ingnored or supressed. The ancient history of mankind has not been forgotten by the people but perhaps the scholars have forgotten it or helped to ignore it as it does not fit in with their theories or lifes work. The people remember the floods, the tales of Atlantis, submerged cities and civilizations. The real problem with the underwater cities is that they have to destroy all our establised mainstream dates/ideas/theories. It will be a Brave New World or a Brave Old World. And when something has been totally destroyed then something has to replace it. Who you gonna believe then? The list of underwater cities and buildings is growing by the year. Here are a few examples of confirmed or possible sites. ** Island of Damsay, Orkney Islands - BBC - "A unique discovery of submerged man-made structures on the seabed off Orkney could help find solutions to rising sea levels, experts have said. They said the well preserved stone pieces near the island of Damsay are the only such examples around the UK. It is thought some of the structures may date back thousands of years. ...Geophysicist Richard Bates, from the Scottish Oceans Institute, said: "We've got other sites down on the south coast of England where we have got submerged landscapes, meso-neolithic landscapes as we have here but what we haven't got anywhere else is actual structures. "I don't say that's unique - that we'll never find that anywhere else, but so far we haven't seen such things before." ** Yonaguni-Jima island, Japan - morien-institute .org - "The controversy that has erupted in archæological circles around the world since the discovery of an enigmatic structure, described by some as 'pyramid-like', at Iseki Point, just off the coast of the southernmost Japanese island of Yonaguni-Jima, some 15 years ago, looks set to get even hotter as news emerges that the so-called 'Yonaguni Monument' is just one of a number of underwater megalithic structures in a 'complex' stretching for many hundreds of miles northeast of Taiwan. ** Gebel Gol-Bahar, Malta (forum DIScussion and also MaltaDiscover .org) - "Gebel Gol-Bahar appears to be an underwater Maltese Temple, of the coast of Sliema about 3 miles out. Here is a 7 minute video link that shows an expeditions dive to the submerged Temple of Gebel Gol-Bahar. At nearly 2 minutes in you will see what could be steps leading down to a flat floor, and just after 6 minutes you will see perhaps what is stunning proof that this is a man made structure and not natural." Amongst those whom are buffs of Norse mythology, there's a notion that the vikings had an oral history going before the last ice age struck. The hypothesis is that the battle against the Ice Giants was not actually a battle against some tribe of giants or neanderthals, but rather that the ice age struck so fast and so furiously that it was like an elemental attack of a giant army. This ties in with the above discussion by the notion that any race sophisticated enough to preserve their history would also likewise be sophisticated enough for population center construction as well, as would their contemporaries whom they had contact with. So if all this were considered true, we have races capable of construction *before* the ice age, during which the sea level was 16 meters(?) below the current mark, all with oceanic technology (boats and fishing) and whom all are going to walk down the hills to get to the new shorelines... meaning there should be lots of architectural remains at this depth around the planet. - Typed on my Android. Please forgive the typos! The lower sea levels suggest that either much land went up and much went down, or else much water was added to the Earth, or else much ice melted. The Andes show evidence of being rapidly uplifted. However water could have been transferred to Earth from another planet during close proximity. Highly electrical conditions could have caused much water to levitate and suspend above the Earth for an extended time, and then have fallen in different electrical conditions. Was the Andes uplifted during interplanetary interaction in Velikovskian times, or during the planetary configuration before this. And the other question is whether the underwater cities represent an early advanced civilisation. It is exceedingly important to humanity now as to whether humanity underwent great trauma, or was once very advanced. Thus we need to recover our past. The Age of Ice Giants? The Norse Mythology and the battle against the Ice Giants is new(s) to me, do you have any good references or articles to read further on that? The idea that the change could have happened suddenly makes sense in the Electric Universe where the Earths environment depend on the EU more than changes in the dust/clouds etc in our atmosphere. I like the idea that "new" buildings during the lower sea levels might be constructed more with woods/hides than stone. As they knew that the sea levels had gone down then they could easily come back up. So constructing temporary structures would be a good answer. Would these structures be everywhere though as some areas may have remained fairly warm when the sea levels went lower? Although I suppose the lower sea levels would mean everyone might think "temporary" instead of permanent. I have always wondered if the "Ice Age"did affect everywhere and not just certain latitudes? The evidence of glaciers carving out all the canyons and valleys has to be questioned. I read on thunderbolts somewhere that the Ice Age have been where the aurora was in an electrical different sky, a ring of ice? I am glad you mentioned wood as i was going to make the list of all possible underwater sites that had evidence. I came across a few mentions of the underwater city in India in the Gulf of Cambay (Khambhat). While i see no problem in this discovery it seems that it might destroy the mainstream idea of "our history" so there is controversy about it. A round of further underwater explorations was made in the Gulf of Khambhat (Cambay) site by the NIOT team from 2003 to 2004, and the samples obtained of what was presumed to be pottery were sent to laboratories in Oxford, UK and Hanover, Germany, as well as several institutions within India, to be dated by Optically Stimulated Luminescence (OSL) and thermoluminescence dating techniques. These pieces returned dates ranging from 13000 ± 1950 BP up to the oldest at 31270 ± 2050 BP, leading to NIOT's chief geologist Badrinaryan Badrinaryan stating that they had uncovered the earliest-known pottery remains in the world, from about 31000 BP." I couldn't find much of a follow up on it, including images so did not include it. Has anyone else got links or knows more that may "prove" that something is there. I suppose the problem comes from the fact that no "advanced" civilisations are thought to have been about before the age of lower sea levels. One half of the issue is accepted, lower sea levels, if people can then accept that humans were more than just a bunch of half animals hunting and gathering then we can re evaluate these underwater sites again and the evidence you mention. But how do we prove that humans built great cities and structures before the lower sea levels so may have continued afterwards? Mo, perhaps we have to have different versions of our history depending on what we think might have happened? As it seems that there will always be doubt as to exactly what happened and when it happened regarding the EU and the Earth we might want to consider a set of possibilities, such as you have mentioned. This way you could say that in a pure Velikovskian model this may have happened, in a "exo water scenario". I have always wanted to write a newer version of our history that is not peer reviewed but based on the ideas that humans have been around for a long time and it is unlikely that suddenly a few thousand years ago we became peer reviewed advanced and civilised enough to build great structures. You "only" wrote 2 paragraphs but such a lot of stuff there to discuss and think about. The water levitating, would that link in to the early legends of the water being in the sky, mist etc or could this also be how the ancients explained where the water came from if it came out of the skies from another planet? If it was in our skies then a change in the EU conditions of Earth could mean that it gets attracted to the earths surface or starts to attract to itself? IF Your going to speculate, then don't forget about water out of sight. It doesn't have to mean a world where beings live, but a zone where water resides. Any drastic change in condition in galaxy local to Earth could easily result in that water been attracted up through the channels to our surface. I have watched water bubble up from underground as the moon interferes locally, what if a great big block of mass neared our system? A hollow Earth would also explain why the mountains and seas bases should change dramatically, as the pressure of push in both direction will be geometrically field related, so as a local zone of field geometries alters thus the push down and push up from inside will bend the thin structure of earths mass like fingers ona balloon? mountains being pushed up as 2 plates collide or is the land beneath them being pushed up or are they still in fact growing taller themselves? the idea of rebounding from the ice age is very strange, why is not all land rebounding? is it just the hollow or growing earth in effect? is it the pushing down of areas around it or the attracting of them downwards or the pushing up on the surface? for the hollow earth you also have the issue with the different types of waves, could one be stopped or deflected by a energised plasma in the middle? this might explain the heat/energy in the middle and the flow of electrical currents and our magnetism? is water in the earth totally neutral or charged? if it is charged then any changes as kevin says might either attract or repel the water in large amounts, floods or sea levels dropping. or could water be created by electrical discharge events so changes in the energy flow of the earth means less or more water? could other planets have had water then due to a complete change in their component vaule in the Electric Universe they stop producing water or no longer need to produce it in the circuit? If one considers that Velikovsky was essentially correct, then one has to consider planets being in different orbits. And this is naturally going to include Earth. And the obvious orbit to consider is an elliptical orbit, and a very elliptical orbit. So what would be the likely effect of Earth being in an elliptical orbit ? Well obviously there would be cyclic hotter and colder conditions. Do we find such cycles in the planet's history ? The ice ages cycled. Don't let the dates and time lengths given to the ice ages fool you. Free your mind from these datings and then look. Could all the polar ice have been formed in only hundreds or thousands of years ? And the answer is most definitely yes, with natural lamination of ice occurring. Then consider what conditions would have been like for the humans of these times of the ice ages. Underground would have looked good at times !! In the earlier configuration of the planets water could have gathered between any planets in permanent proximity to each other. After the break-up of this configuration much dust and still pretty strong electrical conditions would have prevailed. Thus water and dust could have collected in various areas around the planet perhaps near the ionosphere. If one considers that conditions at a few kilometers becomes somewhat fluid, then rebounding becomes pretty obvious. After all a few kilometers depth of ice would exert significant pressure ! And pressure gets transmitted in a fluid. The thing is that the Earth may not have had enough time to come to equilibrium if the ice was all deposited only recently. The speed that the antarctic land has sunk is also clearly very significant in determining global sea levels. Especially when one considers this ice melting and the land under the oceans sinking due to the extra water above. The double layer around a planet called the sheath of the magnetosphere, seems to me to be a likely place for dust and water to collect. Mabe not in the double layer where polarized material would be accelerated, but just outside of this region. And so a hollow planet could form this way. The water from underground could spout up during a near encounter with another planet. But the near encounter would only be brief. However the thunderbolt passing between the planets could evaporate much water and the dust generated could cool the Earth producing considerable precipitation. Gobekli Tepe - the oldest temple or proof of ancient human civilizations? Gobekli Tepe in Turkey is an ancient series of buried stone circles/temples that are said to be the oldest buildings on Earth. The stone pillars have amazing carvings and yet were built by the "hunter gatherers" who supposedly roamed the Earth during those times. Many stone circles/temples were built then covered by dirt by humans. Gobekli Tepe is thus the oldest such site in the world, and by a considerable margin. In fact, it’s so stupefyingly old that it actually predates settled human life. It is also pre-pottery. Gobekli Tepe hails from a part of human history that is unimaginably distant, right back in our hunter-gatherer past. Göbekli Tepe is "unbelievably big and amazing, at a ridiculously early date," according to Ian Hodder, ...Many people think that it changes everything…It overturns the whole apple cart. All our theories were wrong." When you read the reports of Gobekli Tepe it is amazing to see how they ignore what is obvious. That humans and especially human "civilizations" are very ver very ancient. All they can do is say this is amazingly old, these were built before pottery, farming, the wheel etc. The dates of these things can not alter so the temples/circles were built before pottery etc could have been invented/discovered by humans. Of course the dating system relies on Carbon Dating which in an Electric Universe with Catastrophes has serious doubts as to the use of it. This revelation – that early Neolithic hunter-gatherers could have built something like Gobekli – is world-changing. Hitherto, it was presumed that agriculture necessarily preceded civilisation, and that complex art, society and architecture depended on the reliable food supplies derived from farming. Gobekli Tepe shows that the old hunter-gatherer life, at least in this region of Turkey, was far more advanced than was ever conceived. What does it look like and what is the more sensible option? That Gobekli Tepe was built by cavemen hunters who joined together and then created farming/pottery/wheel/villages etc or that mankind is ancient, had culture, technology 10s of thousands of years ago and these are the remains of previous intelligent civilizations that had a reason to build them? The ruins are so early that they predate villages, pottery, domesticated animals, and even agriculture—the first embers of civilization. In fact, Schmidt thinks the temple itself, built after the end of the last Ice Age by hunter-gatherers, became that ember—the spark that launched mankind toward farming, urban life, and all that followed. Built then buried by man? What is fascinating is that these structures were built then covered over by man. Is this part of the originally plan, so they were used to harness the natural power of the Electric Universe or were they blamed as part of the catastrophe and like a lot of the old temples/buildings were covered by man to stop the catastrophes happening again? Also that the hills (Tepe means “the hill of the navel” in Turkish) are covered in flint knapping remains. He saw carved flint everywhere, and recognized a Neolithic quarry on an adjacent hill, with unfinished slabs of limestone hinting at some monument buried nearby. Pillars of Man/Gods or Squatter Man? Are some of the megaliths shaped as men perhaps the "squatter man" images? The eerie stones turned out to be the flat oblong tops of awesome megaliths. These T-shaped ochre stones loom abruptly from the exhausted earth. Most of them are carved with bizarre and delicate images – mainly of animals and birds. One image is a sexualised representation of a woman. Sinuous serpents are another common motif. The stones themselves seem to represent men – some have stylised ‘arms’, which angle down their sides. Gobekli Tepe Temple or Funeral building? Similar to the temples of Malta in that perhaps some of these are not temples but burial/funeral places. Because we know nothing about these places or buildings we self project our culture/ideas onto these ancient peoples. The artists of Göbekli Tepe depicted swarms of what Schmidt calls "scary, nasty" creatures: spiders, scorpions, snakes, triple-fanged monsters, and, most common of all, carrion birds. The single largest carving shows a vulture poised over a headless human. Schmidt theorizes that human corpses were ex-posed here on the hilltop for consumption by birds—what a Tibetan would call a sky burial. Sifting the tons of dirt removed from the site has produced very few human bones, however, perhaps because they were removed to distant homes for ancestor worship. Absence is the source of Schmidt's great theoretical claim. "There are no traces of daily life," he explains. "No fire pits. No trash heaps. There is no water here." Everything from food to flint had to be imported, so the site "was not a village," Schmidt says. Since the temples predate any known settlement anywhere, Schmidt concludes that man's first house was a house of worship: "First the temple, then the city," he insists. Gobekli Tepe - solar observatory? the people who built the temples and stone circules of Gobekli Tepe were obviously an advanced civilization, so it is likely that they observed and followed the sun/moon etc. is there any evidence that Gobekli Tepe or around there has anything to do with being a solar observatory? considering that standard theory has these amazing structures being built by "hunter/gatherers" i wonder if anyone has looked for a connection or would accept any evidence for it? Looking at google earth there appears to be a high ridge to the east of Gobekli Tepe, similar to the 13 Towers of Chankillo Solar Observatory in Peru. Where i have marked "possible solar observatory" is just where a building appears to be excavated, there are likely to be other buildings/circles around the area that might be the different solar observatories (if there are any). Another thing to consider is that they are mainly stone circles, we call them and consider them temples. Considering that our theories never predicted Gobekli Tepe buildings/culture we have to consider all options. it could also be that if there are some buildings on the other side of the ridge that they observed the setting sun. Similar to the possible solar observatory in malta. Gobekli Tepe - Paradise Regained? One of the most important archæological digs in the world, Gobekli Tepe in Turkey has revolutionised our understanding of hunter-gatherer culture. But could it also be the site of the Garden of Eden? I am in a rusty Turkish taxi. Ahead of me, the brown hills roll endlessly towards Syria; from my car I can see a little village of mud houses and open drains. It’s not the most auspicious of places. Yet, if reports are correct, I am heading for the most amazing archæological dig in the world. Even more remarkable, this site might be intimately connected with the Biblical story of the Garden of Eden. Finally, my swearing cabbie scrapes us round another corner, and I see a solitary mulberry tree, stark against the cloudless sky. As we park, I notice dozens of workers and archæologists, all across the hillside. They are hefting buckets of rock, and digging away at the soil. The sense of exalted archæological effort, in this hot and intense remoteness, reminds me of the opening scenes of The Exorcist. I climb out of the car, and a genial, 50-something German man approaches. His name is Klaus Schmidt. He is the chief archæologist here at Gobekli Tepe. Shaking my hand, Schmidt leads me away from the main dig. In the shade of a tented area, we drink sweet Turkish tea from tulip-shaped glasses. Mopping his brow, Schmidt tells me the story of his dig. The modern history of Gobekli Tepe (the second word is pronounced tepp-ay; the phrase means “the hill of the navel” in Turkish) begins in 1964, when a team of American archæologists was combing this remote province of southeast Turkey. The archæologists noted that several odd-looking hills were blanketed with thousands of broken flints, a sure sign of ancient human activity. Despite this, the US scientists drifted away and did no excavating. Today, they must feel like the publisher who rejected the first Harry Potter manuscript. Three decades after the Americans’ near miss, a local shepherd was tending his flock when he spotted something odd: a bunch of strangely shaped stones, peeping out of the sunlit dust. The ‘rediscovery’ of the site reached the ears of the museum curators in the city of Sanliurfa, 50km (30 miles) away. The museum authorities contacted the relevant government ministry, who in turn got in touch with the German Archæological Institute in Istanbul. And so, in 1994, Klaus Schmidt came here, to begin excavations. “I was intrigued. The site already had emotional significance for the villagers,” he smiles. “The solitary tree on the highest hill is sacred. I thought we might be onto something”. He stayed. What he has since uncovered is quite extraordinary. So far, 43 stones have been dug out. They are arranged in circles from 5–10m (16–32ft) across. Around the circles are benches of rock, smallish niches, and walls of mud brick. The unearthed megaliths stand 1–4m (3.3–13ft) high. All of which means there may be other stones of similar size as yet undiscovered; indeed, geomagnetic surveys of the various artificial hills at Gobekli Tepe imply that there are at least 250 more standing stones waiting to be excavated. So far, so remarkable – and if this were all there was to Gobekli Tepe, it would already be a dazzling site: a Turkish Stonehenge, or a Kurdish Carnac. But Gobekli Tepe isn’t just this. One unique factor puts it in the archæological stratosphere. Gobekli Tepe is staggeringly ancient. Carbon dating of organic matter adhering to the megaliths shows that the complex is 12,000 years old. That is to say, it was built around 10,000–9,000 BC. By comparison, Stonehenge was built around 2,000–2,500 BC. Prior to the discovery and dating of Gobekli Tepe, the most ancient megalithic complex was thought to be in Malta, dated around 3,500BC. So how did ‘cavemen’ manage to build something so ambitious? Klaus Schmidt speculates that bands of hunters would have gathered sporadically at the site, through the decades of construction. During the building season, the hunters may have lived in animal-skin tents, slaughtering the local game for sustenance. The many flint arrowheads found around Gobekli support this thesis; they also support the dating of the site. Nonetheless, even for the most resourceful and organised of pre-farming societies, constructing something as refined as Gobekli must have been a powerful challenge, and a serious drain on manpower. They must have had a very good reason to build Gobekli. But what was it? There is more evidence that Gobekli had a religious purpose: the circular arrangement of the stones echoes much later Neolithic temples, like Stonehenge and Avebury. The many rock carvings on the stones also appear much more ritualistic than domestic. Our tea-glasses are empty. We leave the calm of the open tents, and return to the dust and hubbub of the dig. Looking at the circles of enigmatic stones, and their exquisite carvings of lions and boars, it is easy to believe the theory that Gobekli Tepe is a temple dedicated to the hunting lifestyle. What is less easy to believe is the idea that this region of Turkey, these dusty brown hills all around us, once supported a large ‘civilisation’ of hunter-gatherers. Indeed, it is hard to believe that this semi-desert once supported enough animals to justify any hunting at all. His eyes are twinkling as he says this. We are approaching the extraordinary connection with the Eden story. But before we get there, an obvious question is posed. What happened to the landscape? Why is the region now so eroded and barren, if it was once so lush and Edenic? According to Schmidt, it seems that agriculture began here, in the province immediately surrounding Gobekli, sometime around 8,000BC. This indeed was one of the very first places in the world where people farmed. We know roughly when and where farming began, because of the archæological evidence: domestication is a shock to the physiology of man and beast. The skeletons of people change, they temporarily grow smaller and less healthy, as the human body adapts to a protein-poorer diet and a more arduous lifestyle. Likewise, newly domesticated animals get scrawnier at first. But 8,000BC, it seems, was also the time when the local landscape began to alter. As the trees were chopped down, and the soil leached away, the area became arid and bare. What was once a glorious pastoral region of forests and meadows, rich with game and wild grasses, became a toilsome place that had to be worked ever harder. The link is becoming irresistible: a lost paradise, a forsaken lifestyle, a terrible ‘mistake’, even a solitary tree. Could there really be a connection between Gobekli Tepe and the Garden of Eden story? I have more investigation to do, before I reach a conclusion. Promising Klaus that I will return in a day or so, I climb back in the cab, and head off down the dusty road. On the way, I consult my notes. The idea that the Eden narrative in the Bible is an allegory for the transition from a hunter-gather lifestyle to agriculture is not a new one. Several writers and thinkers, like Hugh Brody, have canvassed the idea in the past. What is new is the accumulation of data that locates this allegory precisely in the Gobekli Tepe region. One strand of evidence relates to early farming. Finds in neighbouring Turkish digs show that all Eurasian agriculture might have started around here. For instance, the very first pigs were domesticated at Cayonu, 90 km (56 miles) away. Likewise, wheat species worldwide seem to descend from einkorn wheat, first cultivated on these same brown hills. The taxi accelerates, as the road flattens out. We are heading through cotton fields, irrigated by water from the Euphrates. On the distant horizon I can see the blue Taurus Mountains. In the Bible, it is said that Eden is situated at a point where four rivers descend. Believers have long taken this to mean the Fertile Crescent between the rivers Tigris and Euphrates. Similarly, the Book of Genesis claims that Eden is ringed by mountains. And there are further links. Forty minutes’ drive brings me to the large and vibrant Kurdish city of Sanliurfa. The place seems relatively modern, but it has, according to reports, an extraordinary lineage. My first port of call in Sanliurfa is the local museum. A few pence buys me entrance: a small price to pay for what I am about to see. Tucked inside the first gallery, under the stairs and hard by the fire extinguisher, is a weird, life-size, creamy-grey limestone statue of a man. This statue was exhumed in the ancient heart of Sanliurfa, when foundations were being laid for a bank. Recent carbon dating of the Neolithic temple, wherein the statue was found, confirms that this bizarre effigy dates from 10,000–9000BC. This makes it probably the oldest life-size statue of a man ever discovered: the earliest human carving in stone. The stare of its obsidian eyes is shockingly sad: it seems to be looking across the æons with anguished regret, as if foreseeing the tragic mistakes of mankind. Another quick car ride brings me to the site of the statue’s discovery. It is a local beauty spot known as Balikli Gol, a long and limpid fishpond, surrounded by golden-stoned mosques, teahouses and even a converted Crusader church. Tourists like to feed the fat and excitable fish in the ponds; the legend is that the fish were put here by the Prophet Abraham. The locals also believe that Sanliurfa is the Ur of the first books of the Bible. These are just legends, of course. Yet we now know, if only because of the strange statue in the museum, that Sanliurfa is incredibly old. There has been human activity here for 12,000 years, perhaps continuously. Is it so unlikely that the Book of Genesis would refer to this ancient region, this fons et origo of civilisation? In fact, it’s not unlikely at all – because we know that some places near Sanliurfa are definitely mentioned in Genesis. Next morning, I take a longer cab ride, across the brown flatlands, into the desert wastes further south. The fields are being tilled by Kurdish women in their typical lavender-coloured headscarves. They look weary from the intense heat. This region is so sultry that people sleep outside their houses on raised metal platforms. Eventually we reach Harran, where a ruined tower rises from the roadside. This was once the oldest Islamic University in the world. It dates from the 9th century AD. But Harran’s ancestry is even nobler than that. This is the same Harran mentioned – and twice at that – in the Book of Genesis. This is where Abraham once lived, according to the Bible. Back in the taxi, I make my final journey to Gobekli. On the way, I put all the jigsaw pieces together. Taking into account the Biblical links, the history and topography of the region, the evidence of very early domestication hereabouts, and the data from the site itself, Gobekli Tepe is arguably a temple located within the “Garden of Eden”. Or, let’s put it another way: the story of Eden is a folk-memory, and an allegory, and it tells us of our glorious hunter-gatherer past in this once-fertile corner of Anatolia, before our own activities cast us into a harsher world. Gobekli Tepe celebrates and remembers a wonderful time of plenty, when we had leisure enough to learn the arts, and to cultivate a complex religion, even if we didn’t know how to make pots. And then we fell into farming. Of course, all this is speculation, and highly debatable. What is unquestionable is that Gobekli Tepe is one of the greatest archæological discoveries since World War II. Every day, Klaus Schmidt and his team find something new, something never seen before, something marvellous. As I am about to discover. When my cab stops, and I walk towards the dig, I sense a drama in the air. Excitement is mounting. Some Turkish workmen are uncovering a new stone relief, on a just-unearthed megalith: it shows birds, scorpions and water life; it is exquisitely carved, as fresh and delicate as the day it was chiselled. A group of us gather around to have a closer look. I suddenly realise that we are the first people to see this remarkable artwork in 10,000 years. Klaus Schmidt nods thoughtfully at the new relief. Then he says: “You think that is amazing? Komm!” He strides across the dig and points downwards: “We found this yesterday.” At the foot of another megalith is a perfect sculpture of an animal, actually attached to the standing stone. It is like nothing anyone has ever seen before. It was carved long before the wheel was invented, and it was found yesterday. Klaus Schmidt shakes his head. I have just one question left. Why did the hunter-gatherers of Gobekli deliberately entomb the complex? It seems a bizarre act, as well as a vastly laborious one. Again Klaus Schmidt shrugs. Sometimes those three simple words can be the most exciting of all. Fortean Times | Gobekli Tepe - Paradise Regained? Ancient timbers uncovered as part of engineering work and mistaken for modern fence-posts could belong to a 4,000-year-old walkway across marshland on the Norfolk-Suffolk border, archaeologists revealed this week. The archaeological find, the first of its kind in the region, has been made on the banks of the River Waveney during flood defence work. Iron Age timbers have been preserved “extraordinarily well” according to archaeologists working at the site, on the Suffolk side of the river, near Beccles. Now the contractor, Broadland Environmental Services Limited (BESL), has roped off the area and paid for a three-week dig to take place at the site to see what else can be found out about the wooden structure. Jane Sidell, English Heritage archaeological science advisor called the discovery a “nationally important find”. “This is the first such structure to have been discovered within Suffolk and is one of only a few in Britain,” she said. William Fletcher, from Suffolk County Council's archaeological service, said the find was “something we are very excited about”. “We don't really know what the timbers would have been for, but one possibility is that they could have been used as some kind of boundary marker. They are 3,000 to 4,000 years old. “Another possibility is that it was a walkway or causeway used to get people out across the marshes. The land where the timbers were discovered is owned by Beccles Town Council, and it is hoped that a display might be set up in the town once the dig is complete to show local people what has been found out about the site. As the ground has been disturbed, it was feared that the remaining timbers within the site would start to decompose. Following advice from English Heritage and the county council, BESL has commissioned a full-scale archaeological excavation to record the remains and learn more about the structure. Where the ground has not been disturbed the site will be left intact and preserved for future generations. A team of archaeologists from the county council and the Institute of Archaeology and Antiquity at the University of Birmingham will carry out work to fully assess the significance of the remains and the context of the site. Jack Walmsley, a member of the Beccles Town Council and trustee of Beccles Museum, said his knowledge of Beccles history did not go back as far as 4,000 years, so he was very interested to find out what would come of the investigation. New Zealand and pre Maori peoples? New Zealand and pre Maori people? For some reason, while the rest of the world has been settled for whatever timeframe you consider but at least 1000s of years for all islands and countries, this does not include New Zealand. To even suggest differently is to be called a Racist. How you can be called a racist by investigating history is interesting. Is there any evidence of pre Maori peoples? Surprisingly enough evidence comes from the folklore and history of some Maori tribes. Then there is also records of physical evidence from when the europeans recently came to the islands. There are also more archaeological finds being discovered that may be evidence for the "first peoples". This archaeological evidence, especially the archaeoastronomy evidence may turn out to be very old Maori stuff but it needs to be investigated properly. If there were no "first people" before the Maoris then there is nothing to fear. Although what there is to fear is still a puzzle to me. Near Lake Taupo is a strange formation even if it is natural. It appears to be a pyramid shape although it is called the Kaimanawa Wall. If this is man made how old is it and who built it? There are also a number of stone hut cities or settlements in New Zealand. The Waipoua Forest Stone City is the most famous one, being a vast stone city, now collapsed and mostly buried but with some structures still above the ground. At Tapapakanga Regional Park there is an amazing little settlement of collapsed stone huts. These stone huts are suggested to be collapsed "beehive" huts. Whatever they are you can see the arrangement of them and more curious are the large man made mounds that surround and are part of the stone village. What do they contain and what were they for? There is also what seems to be an ancient horizon astronomy (green astronomy) solar observation complext at Waitapu Valley (Maunganui Bluff) in New Zealands North Island. How old this is is hard to determine but the Maoris appear to have no knowledge of it. Although it may have been built by a Maori tribe that no longer exists. I have visited these sites and can confirm they are there and they are more special than a few photographs and the written word can convey. If you ever visit New Zealand then you really need to have a look at them. * Ancient New Zealand sites - information on possible pre Maori locations from the "Ancient Celtic New Zealand" book/website by Martin Doutré. 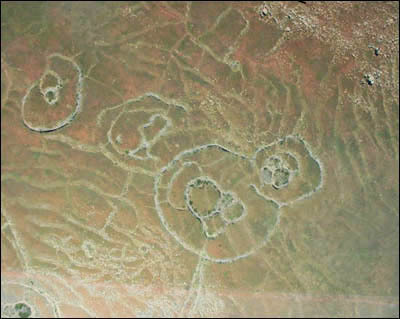 great article on the known stone ruins/circles/city/structures found in south africa. are they cattle corals or solar observatories. could they even be part of the earths natural power grid that the ancients tapped into? these structures are connected by "roads"...some of the images look similar to the "temples" found in malta. is this stone city similar to the stone city found in New Zealands Waipoua Forest? They have always been there. People noticed them before. But no one could remember who made them -- or why? Until just recently, no one even knew how many there were. Now they are everywhere -- thousands -- no, hundreds of thousands of them! And the story they tell is the most important story of humanity. But it's one we might not be prepared to hear. Something amazing has been discovered in an area of South Africa, about 150 miles inland, west of the port of Maputo. It is the remains of a huge metropolis that measures, in conservative estimates, about 1500 square miles. It's part of an even larger community that is about 10,000 square miles and appears to have been constructed -- are you ready -- from 160,000 to 200,000 BCE! The image [top of page] is a close-up view of just a few hundred meters of the landscape taken from google-earth. The region is somewhat remote and the "circles" have often been encountered by local farmers who assumed they were made by some indigenous people in the past. But, oddly, no one ever bothered to inquire about who could have made them or how old they were. This changed when researcher and author, Michael Tellinger, teamed up with Johan Heine, a local fireman and pilot who had been looking at these ruins from his years flying over the region. Heine had the unique advantage to see the number and extent of these strange stone foundations and knew that their significance was not being appreciated. The area is significant for one striking thing -- gold. "The thousands of ancient gold mines discovered over the past 500 years, points to a vanished civilization that lived and dug for gold in this part of the world for thousands of years," says Tellinger. "And if this is in fact the cradle of humankind, we may be looking at the activities of the oldest civilization on Earth." Did gold play some role in the dense population that once lived here? The site is just about 150 miles from an excellent port where maritime trade could have helped to support such a large population. But remember -- we're talking almost 200,000 years ago! The individual ruins [see below] mostly consist of stone circles. Most have been buried in the sand and are only observable by satellite or aircraft. Some have been exposed when the changing climate has blown the sand away, revealing the walls and foundations. When explorers first encountered these ruins, they assumed that they were cattle corals made by nomadic tribes, like the Bantu people, as they moved south and settled the land from around the 13th century. There was no previous historical record of any older civilization capable of building such a densly populated community. Little effort was made to investigate the site because the scope of the ruins was not fully known. Over the past 20 years, people like Cyril Hromnik, Richard Wade, Johan Heine and a handful of others have discovered that these stone structures are not what the seem to be. In fact these are now believed to be the remains of ancient temples and astronomical observatories of lost ancient civilizations that stretch back for many thousands of years. These circular ruins are spread over a huge area. They can only truly be appreciated from the air or through modern sattelite images. Many of them have almost completely eroded or have been covered by the movement of soil from farming and the weather. Some have survived well enough to reveal their great size [see above] with some original walls standing almost 5 feet high and over a meter wide in places. Looking at the entire metropolis, it becomes obvious that this was a well planned community, developed by a highly evolved civilization. The number of ancient gold mines suggests the reason for the community being in this location. We find roads -- some extending a hundred miles -- that connected the community and terraced agriculture, closely resembling those found in the Inca settlements in Peru. But one question begs for an answer -- how could this be achieved by humans 200,000 years ago? An example of what you will see on google-earth. This is what you will see on google-earth at 25 37'40.90"S / 30 17'57.41E [A]. We are viewing the scene from an altitude of 357 meters. This is not a "special" location -- just one we picked at random, within the previously described area. It shows artifacts that are everywhere and we encourage you to search the area with this great internet technology. The circular stone structures are obvious from this view, even though they may not be visible from ground level. Notice that there are many very long roads that connect groups of the circular structures. If you zoom out and follow these "roads" they travel for many miles. The fact that we can see these structures is mainly because natural erosion has blown away the dirt and debris that has covered them for thousands of years. Once exposed to the wind, the rocks are scoured clean and may appear deceptively new. If you look closely at what first appears to be empty land [C], you will notice many faint circles, indicating that even more dwellings lurk below the surface. In reality, the entire area is packed full of these structures and connecting roads. Why has no one notices these before? Once the ruins were examined, the researchers were anxious to place the lost civilization in a historical perspective. The rocks were covered with a patina that looked very old but there were no items sufficient for carbon-14 dating. It was then that a chance discovery revealed the age of the site, and sent a chill down the spine of archaeologists and historians!